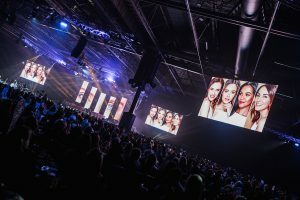 Technical production specialist CPL provided a production design plus sound, lighting and video equipment to Pandora Events for Tropic’s massive spring 2019 ‘glambassadors’ event, staged in Hall 9 at the National Exhibition Centre (NEC) in Birmingham, UK. “Tropic Rocks” offered a hi-energy festival / rock theme to energise the 2500 delegates, for which a look and feel to match was needed. This was delivered by CPL’s Mike Radford who led a crew of 40 for the get in / out and show sections of the one-day event, for which they had one rig day and a second for tech and rehearsals. The event’s format encompassed a lengthy achievement recognition and awards section, new product launches and upcoming incentives, wrapping up with a lively evening party, so the design had to cater these various requirements and practical enough to transform from the conference elements into the evening party in just one hour. 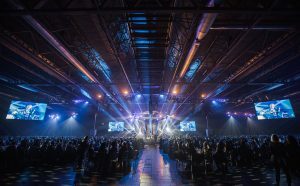 An 18 metre wide by 8 metre deep festival style stage and canopy was built by CPL with a 28 metre long by 4 metre wide runway going out into the audience enabling presenters to move through the arena and get closer to the audience, and the numerous award winners to walk up to the stage, collect their award and then walk down the runway and back to their seats in the auditorium. At the end of the runaway was an elevated triangular shaped B Stage – the catwalk split and passed this on two sides – on which the event band The Air Guitar Band played, delivering all the stings and walk up riffs together with powerful renditions of four rock ‘n’ roll classics – a Queen medley; “I’d Do Anything For Love (But I Won’t Do That)” by Meatloaf; “Alone” by Heart and “I Love Rock ‘n’ Roll” by Joan Jett which were presented as ‘production numbers’ accompanied by custom video content & 27 dancers performing on stage and along the catwalk. Pyro and CO2 effects were also used to accent moments in the production numbers, with 10 x Impact FX CO2 jets positioned on the front edge of the main stage and 8 x Sparkulars positioned around the central triangular stage. 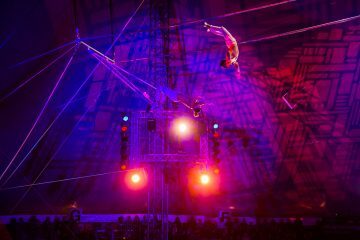 The climax of the final number featured a showstopper with 36 x confetti canons fired from the overhead trussing which blasted out, covering all the 5,525 square metres of floor space in a roof-raising effect! To ensure everyone had a great view of the stage, four large IMAG screens were installed, all made up from CPL’s Roe CB5 5mm surface. The screens measured 6 metres wide by 3.6 high and were positioned either side of the stage, with the two delay screens halfway down the hall. At the back of the stage were six 4.8-metre-high by 1.2-metre-wide columns of the same LED screen providing abstract back drop throughout. Playback video was fed to all 10 x LED surfaces via a disguise one 4×4 media server via a Barco E2 Event Master / processor, disguise providing the background layer and E2 managing PIP’d screen outputs. Disguise was selected to seamlessly map video content across all screens whilst PowerPoint was used to provide flexibility for last minute changes. A four-camera system was also fed into the E2 which outputted a TX to the IMAG screens and there was also a selection of PowerPoint presentation elements which were displayed on the four IMAG surfaces and LED drops rear of stage. The idea was that the disguise server ambient content ran live and the E2 was utilised to PiP over that as needed. 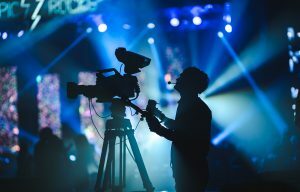 The four cameras comprised three Sony HXC-100s were deployed at FOH centre (with a KJ20x8.5 lens); one at the back of the room fitted with an HJ40 lens for pick ups on the main stage and the front part of the thrust, and the third was on a MOY Dolly track running around the front edge of the stage, fitted with a CJ12ex4.3 wide angle lens. The fourth camera was a hand-held Sony FS7 fitted with a BOXX Meridian wireless broadcast system used for roaming. The band and dancers were all covered fully for the production numbers, and all the awards winners were also picked up and their faces displayed on the screens (as requested by the client so they could enjoy their recognition to the max) and the product presentations with the company’s CEO onstage. Two live makeovers were filmed via the wireless camera. The Video Team comprised of Anthony Condon on E2 with Nick Diacre programming and operating the disguise server. CPL commissioned Paul Brierly to create all the event’s graphics, artwork and slides in After Effects, which were co-ordinated on site by Jordan Pitcairn, whilst the LED screens were tech’d by Jack Sykes and Phil Goldsmith. CPL also created all the bespoke video playback content for the four production numbers, each of which had their own ‘visual’ looks. These were timecoded and ran alongside the five-piece Air Guitar Band’s click. The band went down a storm, coordinated by the lead singer who had his own mix in one ear and the show caller and click in the other! 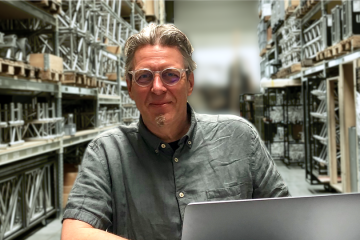 “Having the scope for us to create the video content as well as designing the system really worked well” commented Mike. “Where possible, that’s how we like to work, and it ensures we can deliver a really harmonious looking show”. As an essential part of the visual equation, with lighting, the idea was to “create lots of big, bold, colourful and dramatic festival rock looks” explained Mike, for which CPL rigged over 150 lighting fixtures – a mix of movers and generics – on trussing over the stage and above the audience. These were joined by SGM P-5 LED strobe / washes, ETC Source Four ColorSource Spots COB PARs and other conventional wash lights, together with large quantities of 2-cell Moles and active Sunstrips dotted about, adding to the general festival vibes. In the true spirit of festival lighting, several DF50 hazers were strategically positioned to ramp up the atmosphere. All the lighting was controlled from a grandMA2 light console run by Andy Jones. Just as the lighting aesthetics were based on a big rock show concept, it was essential that the audio had the same attitude and sonics. 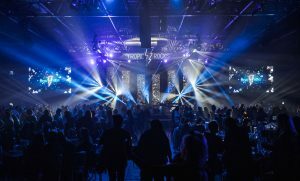 Sound designers Jamie Kendall and Dan Lewis chose to use an L-Acoustics KARA system with around 70 speakers in total over five main arrays which were positioned left and right of the stage, left and right of the thrust and one above the centre of the thrust. Subarrays of L-Acoustics SD18s were on the floor and flown X8s served for the infills, all powered by LA8 and LA12 amplifiers run over a customised Dante network, including 3 x Yamaha Rio3224-D stage boxes which were configured so the consoles could be patched anywhere in the system. Two Yamaha CL5 consoles were operated by Steve Bull (FOH) and Sam Cook (monitors) with the FOH moved from the centre of the auditorium to side stage between the daytime session and the evening party. 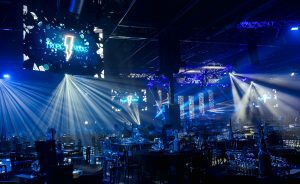 The challenge – in addition to getting the right sound – was to cover the whole room filled with hundreds of tables and chairs with clear, even audio, especially with the Air Guitar Band and presenters who were positioned at the end of the runway and in front of the main stage arrays. For the evening party, the catwalk stage was struck leaving the triangular stage in place becoming the DJ position. CPL also supplied the DJ kit and backline for the bands. A second band, Fully Funktional, were set up on the main stage entertaining guests as the party got started, using a mix of 115XT HiQ wedges and a Sennheiser IEM system for monitors. The Air Guitar Band also used a Sennheiser IEM setup together with Shure Axient wireless packs for guitar and bass mic kits to keep them completely wireless as they sang and played live to track. A full package of mics-and-stands was included in the audio detail for bands and speakers – Shure Axient for the bands, and Shure UHF-Rs wireless headsets for the presenters, hosts and speakers. While CPL were getting in, rigging and setting up, the dancers rehearsed in an offsite studio, so the day of the rehearsals was actually the first time all had been together in the same room. The smooth running of the final performances was a feat achieved with the assistance of CPL’s talented show caller, Lisa Cooley. Mike also employed a stage manager, Rory Garroway, to keep everything running efficiently, on time and in an orderly fashion. Having an SM was a decision taken after the previous Tropic live event, and it proved a smart move. Comms were an integral part of delivering the event, for which Mike specified CPL’s Riedel Bolero wireless system, due to the flexibility of having numerous party lines and being able to integrate monitor feeds from the main audio system. This also provided excellent coverage across the whole space enabling mobile crew to work anywhere. A Clearcom Master-station and wired packs were used for the main production ring with cameras, the stage manager, project managers and the show caller all able to call in to the team who were utilising wireless. “Considerable time was spent planning and detailing” confirms Mike. 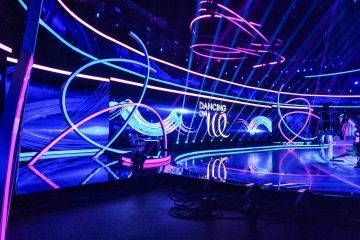 “The whole technical production and design was based on being practical and adaptable as well as looking great, as we knew we would have to accommodate changes right up until showtime, and that the scheduling was incredibly tight. “This resulted in some great teamwork and camaraderie! The crew were all phenomenal, and we really enjoyed delivering a great result for Vanessa and Andrew Carter from Pandora Events and their client”.